Lucy, Ricky, Esty and McGill send you their love on Valentines Day! They have had a big day so far, as it was warm enough for their second visit to the lawn outdoors. They had a bath in their wading pool and primped and groomed a bit for their photo shoot. 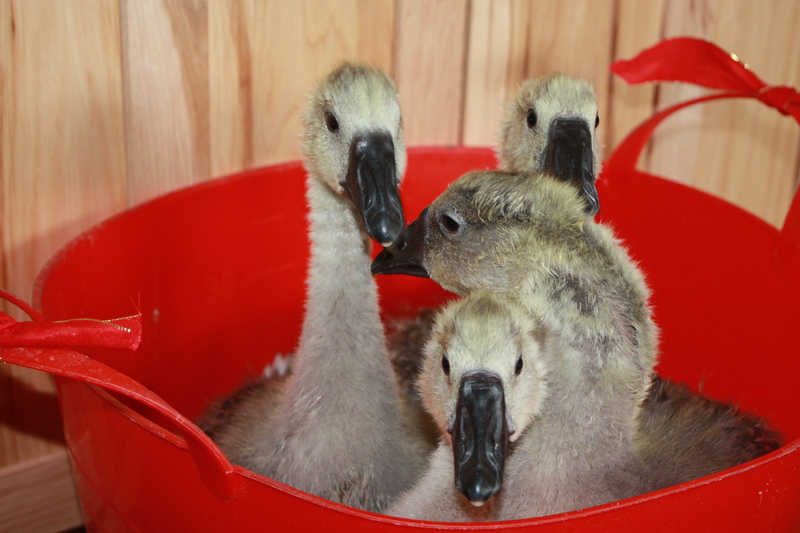 The little goslings have grown ten-fold over their initial size as hatchlings, and will move later this week into new digs with a little more headroom. The wire covering the sheep tank is too low, and they can stick their heads up through the openings and survey their world, which has moved from the laundry room to the basement. Fortunately, our housecat Bleu hasn’t pounced on them just for fun. I cannot ascertain if Bleu is just bored with yet another cage of fuzzy critters in the house, or if he is slightly intimidated by them. We are grateful that so far, the animals have co-existed peacefully. Tomorrow the goslings will be one month old. We are amazed at how they have grown compared to the baby guineas we have raised. And there is universal concern that they have imprinted on Mother Goose. When they hear my voice, they rush to the side of their pen and stick their heads up to greet me and nibble on my clothing. When we take them outdoors to the lawn, they have no interest in anything but clinging to me. If I step outside the fence, they frantically run up and down the fence and poke their heads through in an attempt to reach me. They ignore their food bowl, but will nibble on something from my hand. Now what? How will they learn to forage and fend for themselves away from the house? Will they try to follow me every time I step outside?Ethel had better have some ideas!! This entry was posted in Wildlife blog and tagged fuzzy critters by bygeorge. Bookmark the permalink.